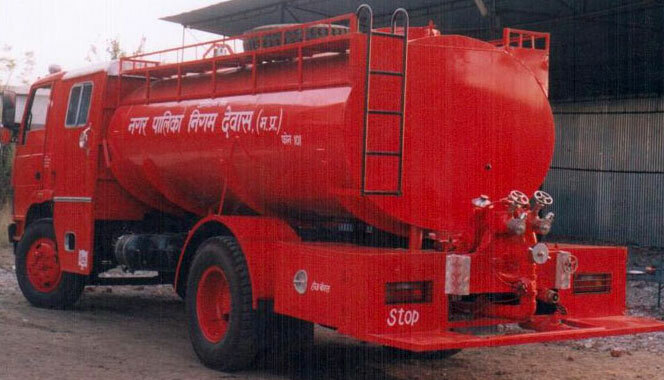 We are a prominent Manufacturer and Supplier of Water Bowser of the finest quality. Our Water Bowser carries water tank of 5000-16,000 liters with a 2250-3200 LPM normal pressure, Multi pressure pump and normal pressure, and Multi pressure hose reel system. The Water Bowser, offered by us, is widely demanded in the market due to its highly efficient single or double stage centrifugal fire pump. Further, we also provide customized Water Bowser to our clients at the market leading prices. Power take off : Driveline P.T.O. of suitable ratio and torque to suit different engines. Water tank : 5000-16,000 ltr. Capacity elliptical type made from 3 -5 mm thick MS plates.